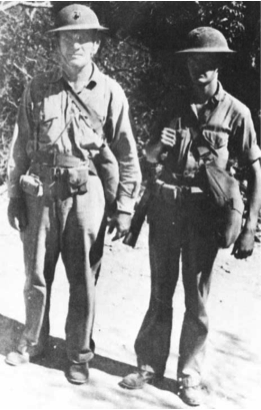 On to Corregidor —Part VII – Fix Bayonets! I cannot imagine the terror of hearing the order of “fix bayonets”… I certainly could never have earned the title of “Marine”. The courage of Cpl. Franklin was not only incredible, but commonplace amongst the Marines there. I grieve for them. Courage was a common virtue … and duty. I am so proud of these Marines. We (the sane of our country) are proud of the US Marine Corps, sir. “While Army officers were quickly appointed to command these companies, they had scant knowledge about infantry tactics.” I wonder, how can that be? Mr. B (a former army officer who’s always had the utmost admiration for Marine officers) added that Marine officers are trained to command. After reading an earlier post on this story, I got the book They Fought Alone about Colonel Fertig who organized guerrilla actions in the aftermath of the surrender. Mr. B is almost done with it, and it is an amazing story. Translated into English his name means ‘ready.’ Colonel Ready – how perfect! Baysider, I want you to know how much I enjoy these conversations. Invite your husband to chime in, as well. At the beginning of World War II, the U. S. Army consisted of regular forces (243,000), National Guard forces (226,000), and Army Reserve forces (150,000) with an additional 104,000 personnel involved in the Army Officer Reserve. These are huge numbers of personnel, and divided up into occupational fields, there were Army officers assigned to command tank units, motor units, infantry units, artillery units, military police units, air defense units, Signal, Corps of Engineers, and aviation units. I am quite certain I missed a few. Compared to the Army, the size of the Marine Corps was infinitesimal. The reason for this is simple: the Army’s job is land warfare. The Marines are part of the Naval Service; their job is amphibious warfare. While there may be similar elements in both of these areas, each demands its own expertise. In 1941, the largest permanent Marine formation was a Marine Brigade. We had two. A Brigade consisted of an infantry regiment and attachments, and a Marine Air Group. In 1941, every Marine unit was significantly under strength. In the Marine Corps, we train all of our officers as platoon leaders; we train all of our enlisted Marines as riflemen. Marines could not afford to waste manpower on such things as signal and logistics. Regular infantry officers performed these functions, along with intelligence and operations —and in many instances, as an additional duty. This brings us to Corregidor in 1941/1942. Many of the Army officers incorporated into the 4th Marine Regiment were specialists. They were tank officers without tanks, aviation officers without airplanes, or they were combat engineers, communicators, adjutants, and motor transport officers. They had no training as infantry officers, and many had limited exposure to leadership positions. I cannot speak to the relationship in the Army between officers and enlisted men, but in the Marines, officers and NCOs form a very close relationship and very often, the more experienced NCO will offer suggestions to the officer about what should next happen. If the officer is bright, he will consider carefully what his NCO has shared with him. In any case, an enlisted Marine has a keen eye; he is able to judge the trustworthiness of his officers. In the Marines, officers earn the trust of their men by leading from the front, through good sense, courage, and by demonstrating genuine concern for the men. No Marine officer will consume his ration until all of his men have eaten. 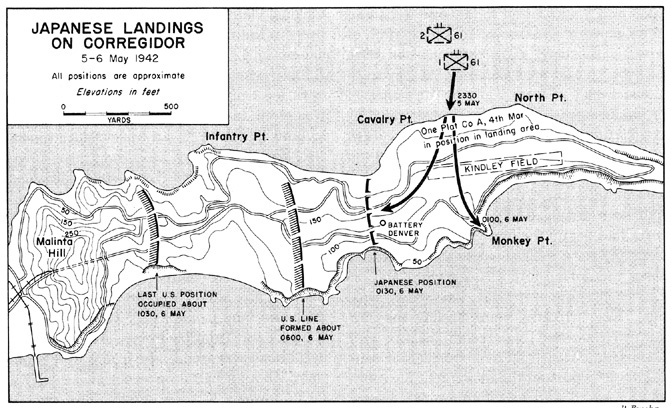 The situation on Corregidor was not the fault of the Army; it was the result of unhappy circumstances. The Philippine Islands was good duty in 1940. MacArthur, while present, was retired from the Army and served as Marshal of the Philippine Army. I doubt if he bothered himself with training of army units stationed in the Philippines. War manifested itself quickly out there and there was scant time to send dependents home before hostilities engulfed Southeast Asia. I think it is a fair assessment to say that Colonel Fertig, while a reserve Engineer, stood above the average officer of this period. He refused to surrender, and without asking for permission, launched an aggressive guerrilla campaign against the Japanese. As you say, it is a fascinating story. Well, thank you for this thorough and interesting context. Mr. B found it a worthy read too, but he generally saves the wordsmithing to me. I had a vague idea that “training” – or lack thereof – was involved. But I hadn’t envisioned the breadth of the issue, which is now easy to understand. I believe you are talking about the fight in which Captain Howard won the Medal of Honor and the pilot a Navy Cross. Yes … extraordinary. I read your comment made in reply to Baysider’s first comment. I enjoyed it very much. And from this civilian’s experience with Marines, the bond between the Gunny and his officer in a combat situation can never be expressed with words… nor fully appreciated by us civilians even if read. But you did a darn fine job though, sir.